Prior to leaving our cattery, the above named kitten has been examined by our veterinarian and ascertained to be healthy. This kitten may be returned to our cattery within four days of purchase if it has been examined by the purchaser's veterinarian and it is found to have an untreatable or life-threatening health condition. Buyer will be responsible for any office visits and veterinary charges incurred. We strive for a virus and fungus-free cattery, and this kitten, TO THE BEST OF OUR KNOWLEDGE, is healthy when it leaves our cattery. However, no guarantee is made against illness this kitten may contract once it leaves these premises. 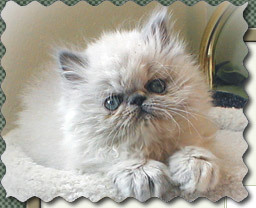 If this kitten has been sold as a PET, the seller agrees to deliver the kitten's registration papers to the buyer within __________ days of valid notification of altering. Buyer is expected to alter this kitten within six months of purchase date. If sold as a BREEDER, registration papers will be delivered at time of purchase. When a kitten or young unproven adult is sold as BREEDER quality, this is an evaluation of the animal's type, not a guarantee of it's ability to reproduce.